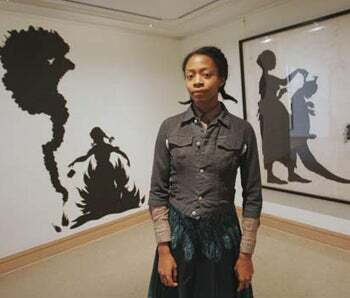 Kara Walker is arguably the most prominent black female artist in the country. She won a McArthur genius grant when she was 27 and was featured as one of the Time 100 last year. Walker's work is idiosyncratic and immediately recognizable: she makes Victorian-era black silhouette portraits pasted on white walls, often depicting graphic and exaggerated stereotypes of African Americans (i.e., the silhouette people have enormous lips and distorted breasts). So in essence, Walker is reclaiming these stereotypes and spinning a new narrative. But an art show currently up at the Arlington Arts Center called "She's So Articulate," claims that the art world dominance of Walker's narrative leaves no room for other black, female narratives. Henry Thaggert, the show's curator tells the Washington Post that this exhibition is "an attempt to reclaim the narrative" from Walker. And he's not the first to question Walker's work. Back in the 90s when Walker won the McArthur grant, conceptual artist Betye Saar called for a boycott of Walker, because her art was a "revolting and negative and a form of betrayal to the slaves, particularly women and children. [I]t [is] basically for the amusement and the investment of the white art establishment." While promoting the work of black artists is certainly something to encourage, it seems that doing it while tacitly denigrating the success of another artist misses the point. Perhaps, if one is mired in the notoriously myopic art world, it seems that there is only room for one black voice and one black narrative. As a reasonably objective viewer outside that world, I find it hard to believe that anyone would take Kara Walker's art as the only and final word on racism. Isn't race in America an enormous and multifaceted topic that will surely be examined by thousands upon thousands of people through art for hundreds of years to come?